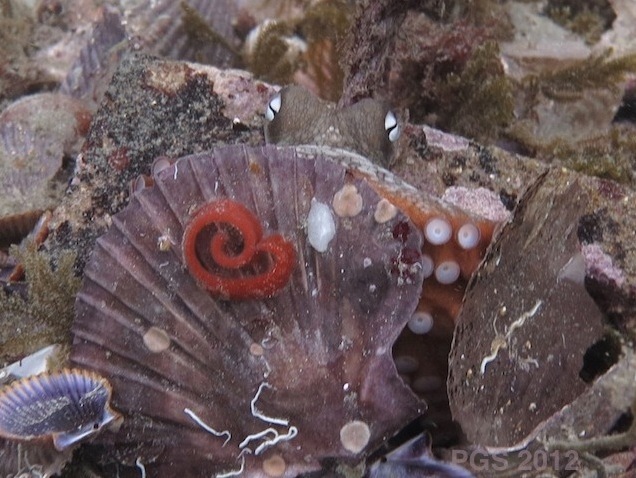 Other octopuses have developed more portable dens. In 2009 Julian Finn and his co-workers published an article describing octopuses in Indonesia who carry round pairs of half coconut shells to use as portable shelters. One half-shell would be nested inside another, and the octopus would carry the pair beneath its body as it stilt-walked across the sea bottom. The octopus would then assemble the half-shells into a sphere and climb inside. A few months ago I posted a description of a recent trip to Octopolis, a site I study, when I can get there, on the east coast of Australia. 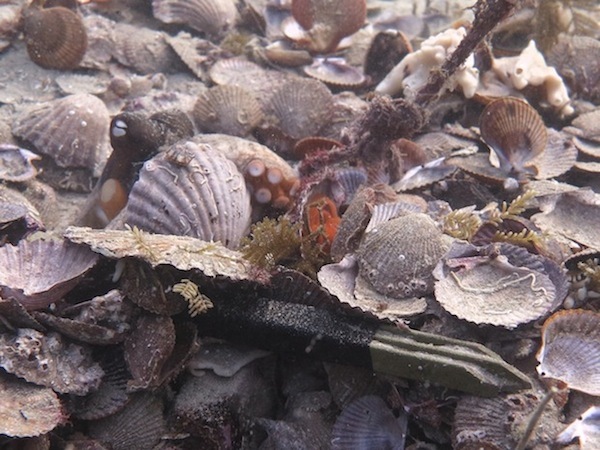 This site has a large bed of scallop shells that, we suspect, is mostly due to the accumulated effects of octopuses foraging for food. On a previous trip last year I brought out some stakes to hammer into the sea bottom to mark the approximate boundaries of the shell bed. The aim was to see how the bed changes in size and shape. These stakes are about 7 inches long and made of plastic, so I taped a heavy metal bolt along each one to give them more weight. We hammered them in so that only an inch, or less, sat above the sand, and placed them at the four compass points. They are very inconspicuous, hard to see unless you know exactly where to look. 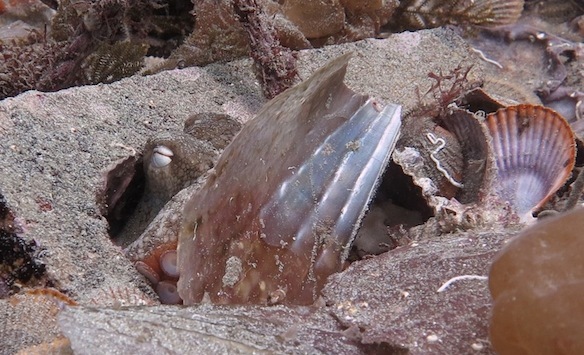 In January I went out to see how the stakes were related to the shell bed boundaries, and found that one of the stakes had been hauled out and was now part of the pile of debris round one of the octopus dens. How did it get there? 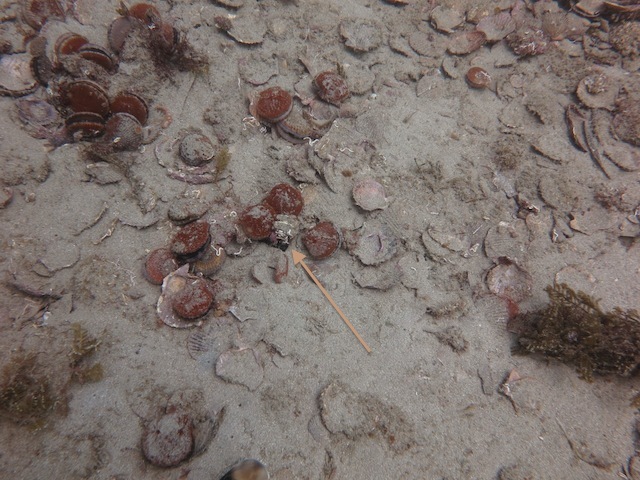 As far as I can see, the octopus (or an octopus) must have decided to pull the stake out of the sea floor. Perhaps it was pulled out to see if it was edible, and either then or later, someone decided to take it home. A plastic stake with a bolt taped along it certainly does not seem likely to be edible, though, and it is pretty heavy too. It had been dragged a meter or so from the place I’d hammered it in. This object has no practical use around a den that I can think of. And I don’t think the octopuses are behaving like Bower Birds, bringing in decorative objects to attract mates. The general pattern in this species seems to be that males visit females in their dens when they mate, or set up a den right near the female. I suppose it is possible that interesting dens attract mates, but at this stage I’d doubt it. The previous post was about whether it is OK to eat cephalopods, and whether the complex way octopuses engage with the world shows a kind of cognitive capacity that gives them an unusual moral status among animals. 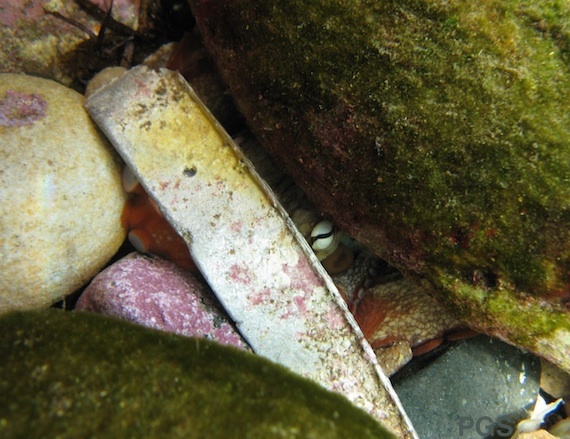 These behaviors with their dens are a good example of the complexity with which octopuses go about their lives. 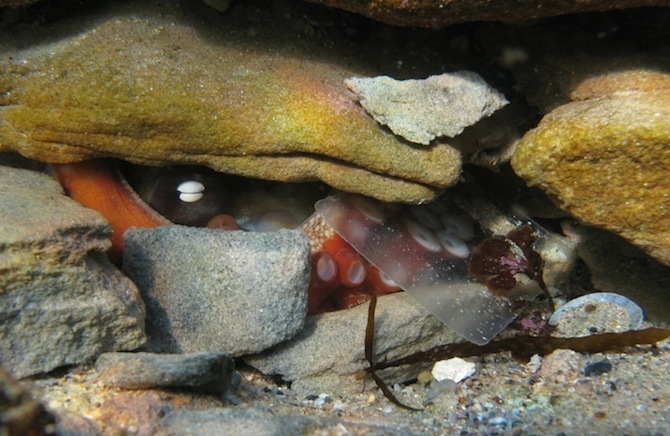 As far as I can see, octopuses are interested in sheer novelty, and bring unfamiliar objects back to their dens whenever they can. Often they must be interested in these things as food, but the perspex sheet and the marker stake, especially the former, don’t seem likely sources of food. I think these octopuses have a sense of what is normal in their environment, and what is unusual, and they are interested in the novelties. The full article by Julian Finn, Tom Tregenza, and Mark Norman about the coconut-carrying octopuses is here. I don’t know if it was the same octopus showing off his shell collection in October and hoarding marker stakes in January. 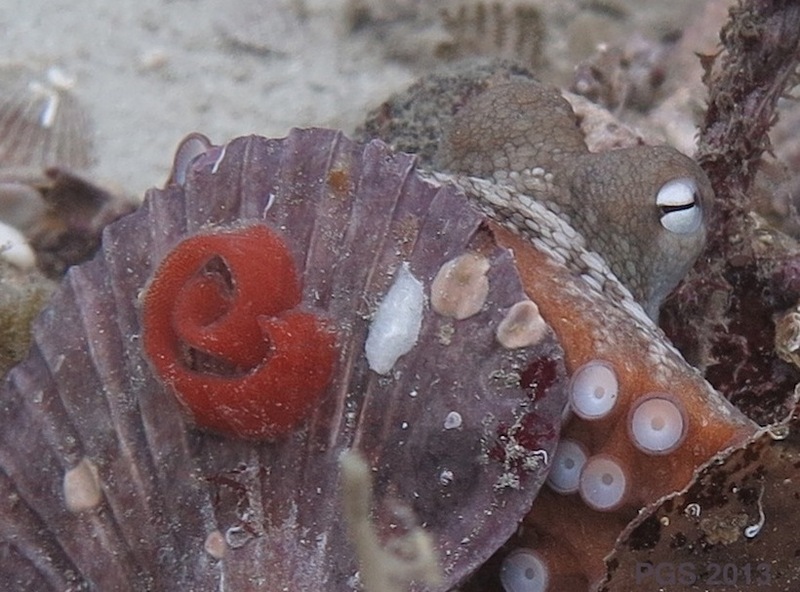 The red swirl itself seems to be likely to be a batch of nudibranch eggs, of unknown species (thanks to Charles the Californian aquariest and David Scheel). This shot below shows more detail (click to enlarge), and see here on WetPixel for a shot of a nudi laying an egg spiral of roughly this kind (pic 2o in the series).